At Sunshinestories, we pride ourselves on being accessible for all ages 10 and up. We feel that age knows no boundaries here, and it’s so special watching guests come together, all nationalities, all ages, all on different paths. A few weeks ago we welcomed a group that were no exception to this rule. 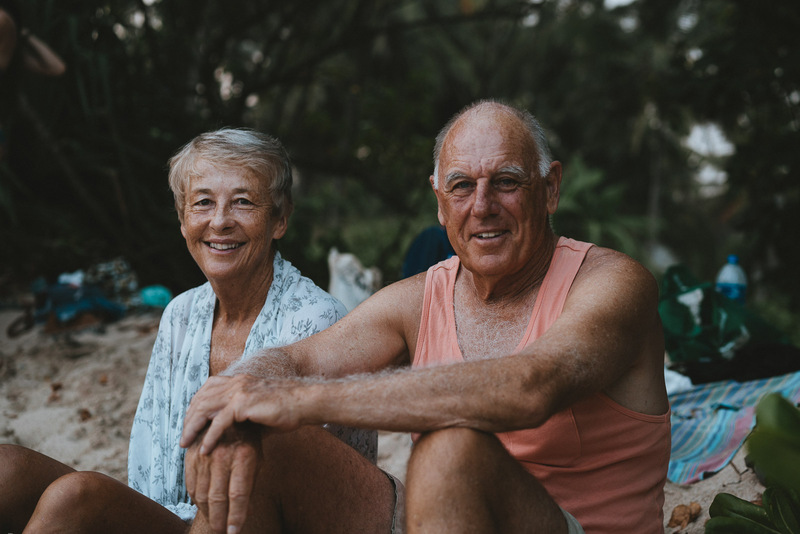 At the lead were Margaret & Peter (69 & 71 years old respectively), the couple the Sunshinestories staff loved to love, who celebrated their 49th Wedding Anniversary during their stay with us. 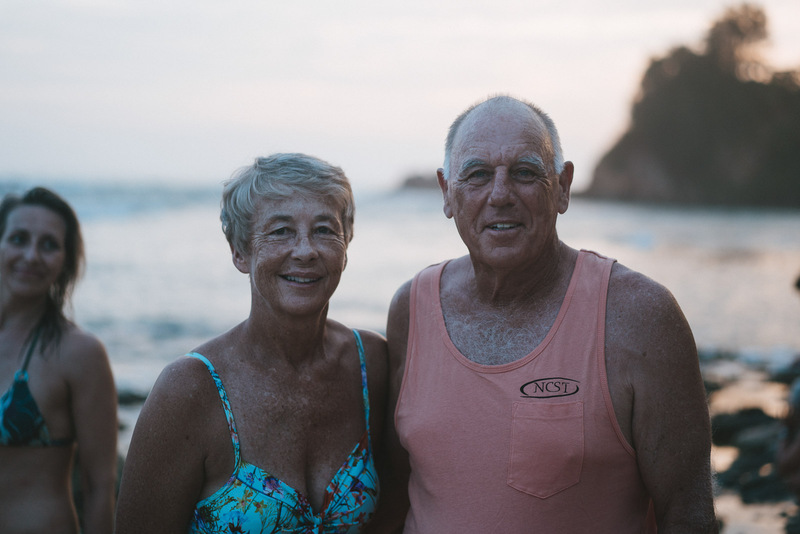 We caught Marg & Pete before they left to find out more about this inspiration team, and how they’ve kept up their passion for surfing (and each other!) after all these years. Congratulations on your recent anniversary! What made you decide to choose Sunshinestories to celebrate it? Marg “It happened pretty organically. Our friend Karen who was also on the trip instigated it. Originally it was a girls trip but as I’d recently just had one, I couldn’t leave Pete out again. Karen said it was no problem as another couple were coming, but they later dropped out.” Oops! 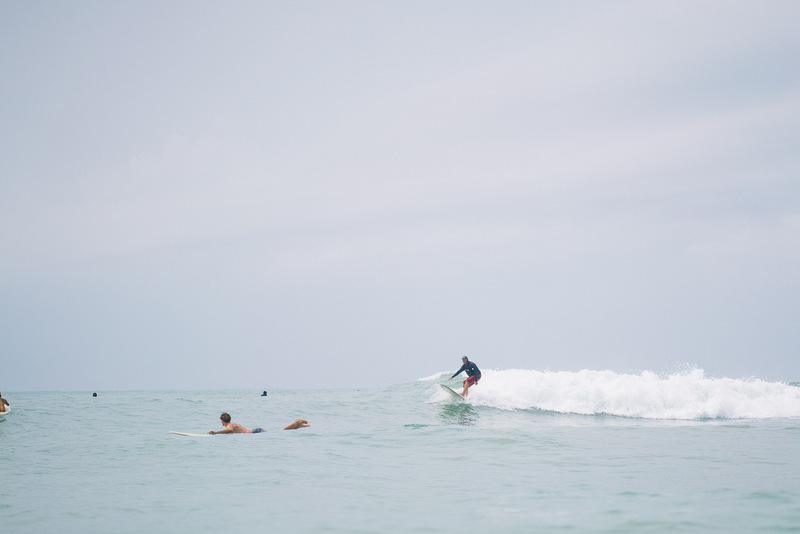 When did you discover surfing, did you love it from the start? Marg began her surfing career when she was 15. She got her first board from Pete as a Christmas gift. Incidentally it was that same dark-blue log. “Heavy as led!” Marg tells us. “I didn’t really surf when I went out, not how I try to now anyway, I would mainly stand there with little movement. I spent more time sitting out back looking pretty in a bikini. No one talked to me, women didn’t surf back then. I learnt what I could from the boys. As such experienced surfers, do you feel like you can ever stop learning? Did you learn anything new at Sunshinestories? How do you feel surfing has changed throughout the years? How have your personal styles changed? What do you love about your surf trips taken together? You are both in such fantastic shape, is that all down to the surfing or do you have any secrets you’d like to share with us? Marg “People don’t believe we are still surfing at this age. A fisherman took me aside the other day and asked me my age. They was a huge exclamation amongst him and his friends, they couldn’t get their heads around it. I then told them my husband is 71, more shock! Has you passion for the sport been passed down to your family? Can you run us through a normal day in the life of Marg & Pete? Who are you all time inspirational heroes? Marg: “Any longboarders surfing gracefully really inspire me. Your new surfcoach Ash is my new hero! Marg, do you have any advice for young girls beginning their surfing journey? “I always say to girls who are learning, always remember that we all started right where you are. No one miraculously becomes Kelly Slater. These days, girls are learning to surf a lot better, a lot quicker, and with the correct skills and methods. The teaching levels available now weren’t possible when I was learning. I can’t express how important getting the correct lessons are. Loved that interview, thank you! One of the most encouraging/heart-warming stories I’ve read so far at Sunshinstories! I was planning a girls trip to your camp later this year, and now I’m wondering if I should be doing it with my fiance instead (in order to set the right foundation for the years ahead). Would be such a fun tradition! This is so beautiful ? my son is 9 (10 next April) and I started surfing at 35 when I chucked him in some lessons. Looking forward to coming on a surf trip together! I often do surf trips solo but this article has made me want to come with my partner to SS. ? I would love to meet the couple here ?